Move over Topher Grace, there’s a new Venom heading our way and the internet’s favorite boyfriend is playing him. Marvel and Sony just debuted the first teaser trailer for Venom, aka the standalone movie about the alien parasite Spider-Man villain, and while the footage has copious amounts of Tom Hardy in it there’s actually no sight of Venom at all. Talk about saving the good stuff for paying customers. While Venom has always been a supervillain in the comics, Sony is going out on a limb and describing him as a “lethal protector,” meaning that when regular guy/disgraced journalist Eddie Brock gets infected with the alien parasite, maybe he won’t go full villain? Could Tom Hardy actually be playing one of the good guys for once?! That would just be perfect. But given the fact that his voiceover is talking about fighting with his own personal demons, it looks like he’ll be struggling against the more lethal side of his new personality. 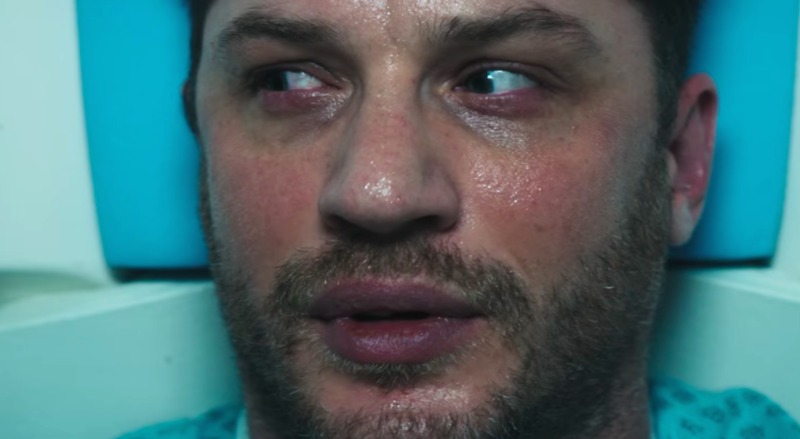 The trailer shows Eddie in an MRI machine, and his earlier calm gives way to him absolutely freaking out when Venom takes over. The most you see of Venom, however, is just some black veins popping out of his neck before the title card takes shape. Why are Sony and Marvel holding out on us? First came the minimalist poster, then the lackluster photo and now a trailer without any Venom at all? Come on, we need just a little taste to erase the memory of Spider-Man 3. Also missing from the trailer is Spider-Man himself. The internet can’t stop speculating over whether Tom Holland will be making a cameo, which would tie Venom into the larger MCU, but unfortunately this trailer doesn’t give us a definitive answer. If he doesn’t show up, Venom will have to create its own origin story, which could be interesting on its own. The Spider-Man spinoff film trailer also shows Riz Ahmed looking extra devious and a little too excited about what looks to be the Venom symbiote in a glass container surrounded by scientists, so it’s more than likely that he’s playing the head of the mysterious and nefarious Life Foundation. Also, Michelle Williams is there for about a second looking concerned, but hopefully there’s more for her to do in the film than just be a worried girlfriend. Venom hits theaters October 5th, 2018.